The smaller the Great Pyramid is, the faster it grows with every stone set. 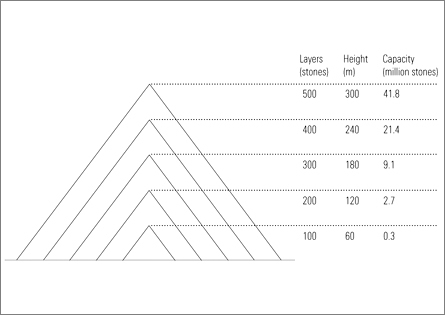 A thirty-meter-high pyramid will be raised one more horizontal layer if 2,601 stones are added. Once it has reached a height of one hundred meters, 28,000 stones will be needed to add another stratum of stones. Capacity is practically unlimited. A 150-meter pyramid can contain up to 5.3 million stones. One hundred million stones will result in a structure only four hundred meters high. Height, however, is not the decisive factor in terms of the structure’s significance. Even with only a few tens of thousands stones set, the Great Pyramid will individually memorialize more people for ages to come than any other monument in existence.